"The most unfortunate thing is that India still seems to believe in proprietary solutions. Further spread of IT which is influencing the daily life of individuals would have a devastating effect on the lives of society due to any small shift in the business practice involving these proprietory solutions. It is precisely for these reasons open source software need to be built which would be cost effective for the entire society. In India, open source code software will have to come and stay in a big way for the benefit of our billion people." Project FOSSEE listed under 'resources for students' on the AICTE website. FOSSEE Summer Internship 2017. Last date to apply 28 Feb, 2017. FOSSEE team has developed a Free/Libre and Open Source Python-Django based web application to conduct online programming as well as MCQ based quizzes. It is an online solution to test the practical skills of students in various programming platforms like Python, C, C++, Java, Scilab & Bash. FOSSEE has taken efforts to raise the level of Scilab toolboxes. Following are some of the toolboxes we are working on: Image processing toolbox, Signal processing toolbox, Communication toolbox, Optimization toolbox, Identification toolbox, Control systems toolbox, Scilab to C toolbox. In order to allow anyone to easily view, modify, and run the Python textbook companions, the FOSSEE team has made these available online. 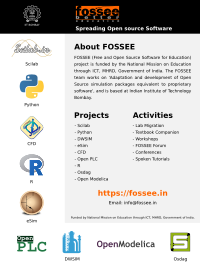 This is done by using IPython notebooks that are hosted on our server at https://tbc-python.fossee.in. This environment allows viewers to use the examples with just a browser. NGHDL is a mixed mode circuit simulator developed by FOSSEE, using NgSpice and GHDL. In NGHDL, NgSpice is used to simulate the analog components and GHDL is used to simulate the digital components, where the analog and digital components are communicating through socket. Scilab is a free/libre and open source software for numerical computation developed by Scilab Enterprises, France. Scilab also includes Xcos which is an open source alternative to Simulink. Python is a general-purpose, high-level, remarkably powerful dynamic programming language that is used in a wide variety of application domains. It supports multiple programming paradigms. eSim (formerly known as Oscad/FreeEDA) is an EDA tool for circuit design, simulation, analysis and PCB design. It is developed by the FOSSEE team at IIT Bombay as a free/libre and open source alternative to OrCAD. DWSIM is a free/libre and open source CAPE-OPEN compliant chemical process simulator. Helps understand the behavior of Chemical Systems by using rigorous thermodynamic and unit operations models. OpenFOAM is a free/libre and open source CFD toolbox useful to solve anything from complex fluid flows involving chemical reactions, turbulence and heat transfer, to solid dynamics and electromagnetics. OpenModelica is a free/libre and open source environment based on the Modelica modelling language for modelling, simulating, optimising and analysing complex dynamic systems. The Textbook Companion (TBC) activity aims to port solved examples from standard textbooks using a Free/Libre and Open source software. Make individuals learn FLOSS through a practical approach. Provide a huge database of Textbook Companions as a learning resource. To make it easy for users of such textbooks to start using FLOSS. To improve the documentation available for FLOSS. Lab Migration aims to migrate labs that use proprietary software to a Free/Libre and Open Source Software (FLOSS) only lab. Colleges can save a large amount of money that is spent on procuring licenses for commercial software by switching to FLOSS. Provide suggestions on the different ways FLOSS can be implemented in the laboratory. Coordinate the migration of the lab to a FLOSS only laboratory. For assistance in installation and use of the Free/Libre and Open Source Software, we recommend you to visit the FOSSEE Forum to post your queries. This forum is monitored by domain experts who would attend to your queries. Note: Before posting your questions, you are requested to go through the list of questions already answered. There could be similar queries with solutions already provided. We conduct various conferences, seminars, hands-on workshops to introduce FLOSS users to various developments in the respective FLOSS.Through these events, we also aim to evangelize the tool among new users.